Wales' first minister has warned of a potential "national tragedy" after MPs voted against Theresa May's Brexit withdrawal agreement again. Mark Drakeford said it was a "farce" of the prime minister's making. MPs rejected the deal by 344 votes to 286. The first minister urged them to find a compromise that can get a majority. But Welsh Secretary Alun Cairns blamed Labour, accusing it of trying to create the "greatest chaos possible" in voting down the deal. It is the third time that the withdrawal agreement has been voted down in the House of Commons - in part with the help of Conservative rebels. What do Welsh MPs think about Brexit? Mrs May said the UK would have to find "an alternative way forward", which was "almost certain" to involve holding European elections. The UK is due to leave the EU on 12 April without a deal, unless a further extension is agreed. The Labour Welsh Government in Cardiff, led by Mr Drakeford, has warned that a no-deal Brexit will be economically damaging to Wales. "This is a farce of the PM's making, which risks turning into a national tragedy," he said. "MPs must now put country first and find a compromise that can command a Commons majority. If this fails, then the only way forward is to take the decision back to the people through a public vote." But Labour Cardiff North MP Anna McMorrin tweeted that there "can be no compromise". "Parliament has now had three chances to vote in the deal, yet the British people are still waiting for their first," she said, calling for a further referendum. 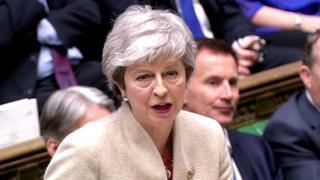 Unlike previous votes on the deal, the prime minister had tried to separate the UK's future relationship with the EU from the agreement that covered how the country leaves the union. Most of Wales' MPs opposed the deal largely on party lines with only two Tory rebels - the pattern following earlier votes. Guto Bebb and David Jones joined the 27 Welsh Labour MPs and the four Plaid Cymru members in voting against the agreement. The remaining six Conservatives - Alun Cairns, Stephen Crabb, David Davies, Chris Davies, Glyn Davies and Simon Hart - were the only Welsh MPs to back the deal. Image caption Alun Cairns said the deal was the only way to leave the EU in an "orderly way"
Welsh Secretary Alun Cairns accused Labour of "trying to create the greatest chaos possible at a time when we need to be acting in the national interest". "This deal is the only way to leave the European Union in a smooth and orderly way," he said, accusing Labour of putting the UK "in the hands of the European Commission". But that was rejected by Mr Drakeford. He said it was the Conservatives failure to persuade their own MPs "that has led Mrs May into this cul-de-sac". Preseli Pembrokeshire Tory MP Stephen Crabb said MPs had "let the country down". "I don't know whether we can try again with this deal," the former cabinet minister said. "We tried hard to get this through. I believed in implementing the referendum outcome. "We had an opportunity today to leave the European Union and I'm very disappointed that a coalition of MPs have come together to stop that happening." Image caption Glyn Davies said the government's Brexit deal "may be dead"
Ynys Mon Labour MP Albert Owen said the result was "not unexpected" and called for compromise. "It's a third time she's lost, and she hasn't moved her red lines. She just thinks that the will of Parliament will fall to her - it will not." MPs are expected to vote on alternatives to the PM's plan on Monday. Tory MP for Montgomeryshire Glyn Davies, who voted to leave, said the government's deal "may be dead" but could return with additions to it as a result of the votes. "We've just voted against everything," he added. There isn't a single way forward we've voted for. Every MP feels a sense of embarrassment about that." Liz Saville Roberts, Plaid Cymru's leader at Westminster, said: "If it is good enough for the Tories to have multiple shots at deciding on our European future, how do they have the nerve to claim that the people are somehow unworthy of a final-say referendum?" She added: "The people of Wales deserve better than this failed empire of a union. "Timbers of this ship of state are rotten, and Wales must look to Europe and to ourselves for our future."